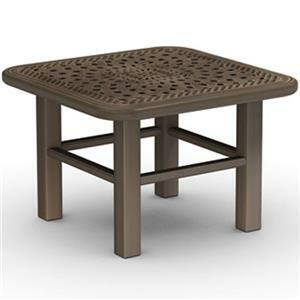 Intricate designs atop this table top is the ideal addition to you backyard retreat to dine in the sunshine. 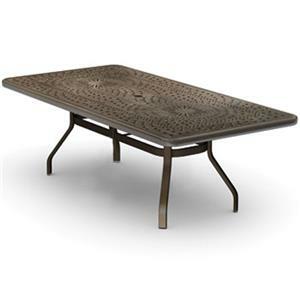 This cast aluminum table has an elegant top paired with splayed legs for a look you are bound to love. Complete with an umbrella hole for your umbrella, enjoy meals in the shade. 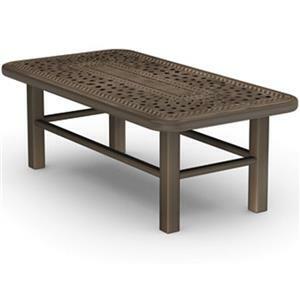 Pair this table any outdoor chairs for a look that you will love. The Camden Cast Round Dining Table with Splayed Legs by Homecrest at VanDrie Home Furnishings in the Cadillac, Traverse City, Big Rapids, Houghton Lake and Northern Michigan area. Product availability may vary. Contact us for the most current availability on this product.